When feeding on mussels or oysters, the oystercatchers locate food visually, wading through slightly submerged shellfish beds. 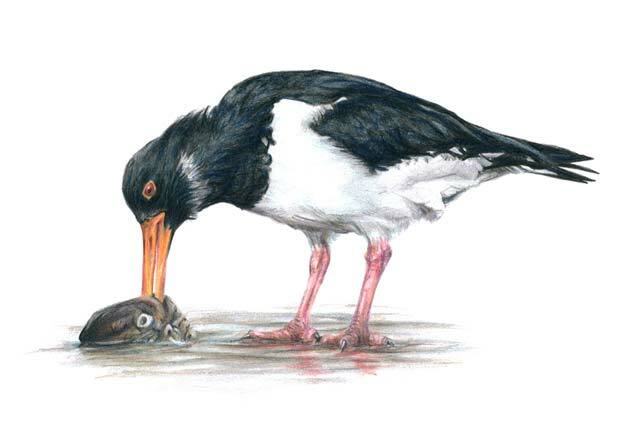 When a bivalve with open valves is located, the oystercatcher employs a technique known as "stabbing," whereby it quickly inserts its knife-like bill into the open valves, and with several quick thrusts severs the adductor chain that holds the two valves together. The bird then extracts and consumes the soft parts.